Almost indestructible fibre tip pens! 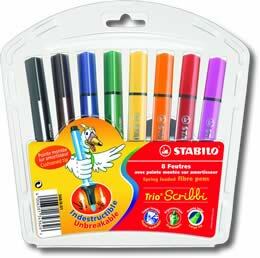 Stabilo Trio Scribbi are brilliantly coloured pens have a spring loaded, thick nib, which means if it gets pushed down too hard it just pops back up! No more felt pens with the nib flattened into the barrel. Ergonomic grip which is perfect for little hands or for comfort for bigger hands. Fully washable, non permanent ink.